My eldest son and his lovely wife on their Wedding Day. Technical details are sparse as the exif was partly stripped in editing, and the original file was lost in a hard drive crash. A fantastic capture of a handsome couple at the peak of their festive joy. Well done. > A fantastic capture of a handsome couple at the peak of their festive joy. Well done. Thanks very much, Mark. I must admit I've always liked this as do my son, Richard, and his wife Fran. They now have two lovely daughters, the elder one being the subject of my submission 'Pensive Olive'. The timing is very good and here I agree with Mark. But at the same time the image is chaotic with lots of things in it and the main subject not sufficiently isolated from the background. For instance the lady behind in the middle and the wall are too much in focus. The head of the bride seems to extend into the man with the hat in the top right. A larger aperture (resulting in a shallower DOF) would have helped. Perhaps you are also a bit too close to the subject. Not perfect either because my position was bad, but at least the married couple is isolated from the background. > with lots of things in it and the main subject not sufficiently isolated from the background. > the bride seems to extend into the man with the hat in the top right. > bit too close to the subject. Thanks for your comments, which I agree with. 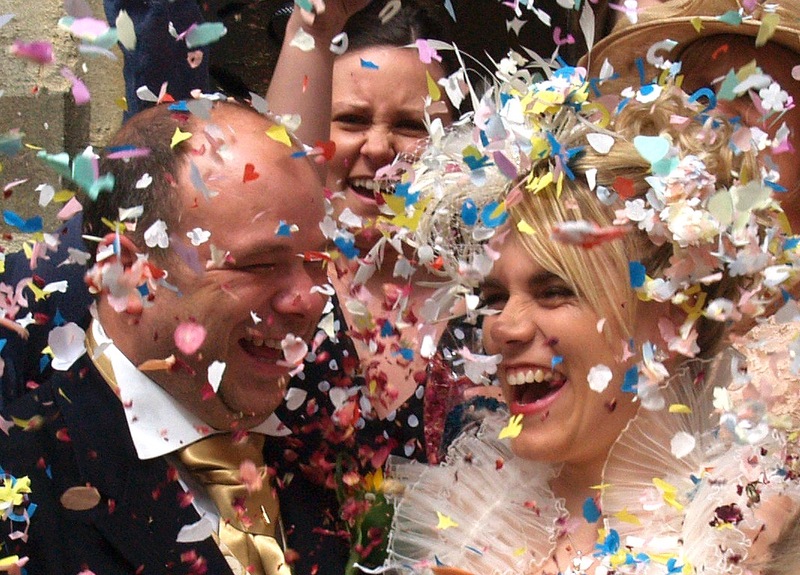 I've always considered this to be a lucky 'snapshot' which, despite all its' technical failings, captures the mood of the moment rather well, being taken when both bride and groom where laughing joyously and whilst the blizzard of confetti was at its' maximum.